It would be unfortunate if you were arrested as a teen and have a criminal record created. This can be very detrimental to your future as a record can prevent you from doing and receiving a lot of things. Juvenile mugshots are taken if you were arrested and processed as a teenager. This forms part of the information that they would use to identify you for future reference. Firstly, the correct name is a booking photo but it is popularly referred to as a mugshot. This is a picture that is taken when a person is arrested for a crime and booked in jail. This is done so that law enforcement agencies have identifying information for the individual that has been arrested as well to allow witness to identify them in the course of an investigation. This picture is also taken in the case of a juvenile crime. It has two parts, one shows the front view of the individual and the other shows a side view. A juvenile arrest record is automatically created when the teen is brought in for a crime and is booked. The record bears the details of the arrest and subsequent conviction. There is certain information that is included on the criminal record such as the accused name, date of birth, address. Personal details such their weight and height and any distinguish marks are also taken and put on record. 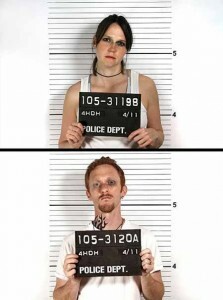 Wondering how to find mugshots of people? It can be really interesting to say the least to search for mugshots either for professional purposes or just for fun. You might be surprised to see how many of your friends and neighbors have been arrested in the past. With the advancement in technology and the increase use of computers mugshots are easy to find on the Internet. There are numerous sites created that is designed specifically for finding mugshots of people whether it be celebrities, a friend or family member. Here are a few steps that you can take to find mugshots. You can almost find everything on the Internet including booking photos. Select a search engine and type in the state the individual was arrested. Among the options you would get is the department of corrections in that state that more than likely have arrest records of inmates in that state. You would look for inmate search and type in all the information that you have of that person. You can check online police records or your local sheriff’s office website. Most law enforcement agencies have online database that are open to everyone which would allow you to find information on individuals who have been arrested. Mugshots are available to everyone online so all you would need to do is Google the individuals’ name, state, and all pertinent information that can narrow the search. It is bad enough already that you have a criminal record as a teenager and your photograph is out there for everyone to see. Needless to say this is not the end of your life. There are options that are available that you can use to clear or seal such information that would inevitable remove your juvenile detention mugshots. An arrest as a juvenile can haunt you in the future in many ways even after you have paid your debt to society. One major area that it can affect is in your professional life. Background checks by employers are becoming common now more than ever and your arrest as a teen will no doubt come up in such a search. Consider yourself lucky as you may be able to get your juvenile records expunged or sealed. This allowance varies from state to state and county but some states allows for this to take place after a certain age. Individuals then do not have to acknowledge that they committed such crimes, and the records are destroyed or hidden from most non government employers and agencies. What it is to expunge or seal juvenile records? Expungement is the process whereby criminal records are sealed and become unavailable to the public as well as state and government agencies. This process gives the petitioner the option of denying the fact that the crime ever happened. All documents associated with the arrest and conviction including the juvenile detention mugshots will be hidden from the public. These records will not show when an employer conducts a background check on the individual. A background check is a search done by employers on prospective employees to verify if they are trustworthy and is a good fit for the company. There are requirements that an individual must meet before they are eligible to get their juvenile records expunged. Depending on the state it may require that the juvenile be 18 years or older and maintain a clear record when they reach legal age before they can qualify for this process. They must serve the conviction time, complete all probation and pay all fines and restitution before applying for an expungement. The sealing of records is similar to the expunge process but is not necessarily the same. To seal your records means that all criminal convictions or arrest will become unavailable to the public, when seeking information on mugshots whether it is online or documented in a state or county office. The information will also become unavailable to some state and government and non government agencies.